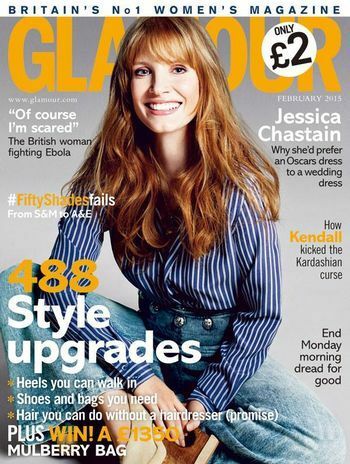 Chastain appears on the cover of the February 2015 issue of Glamour UK magazine. 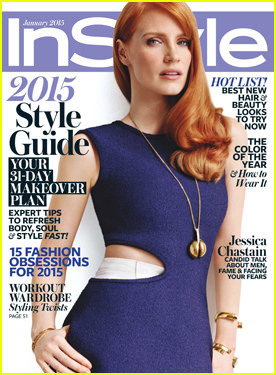 Chastain appears on the cover of the January 2015 issue of In Style magazine. She talks about filming The Tree of Life and not dating actors. I made sure when I started that I was known for my work, not for whom I was dating. Acting is all about being open to another person, and to date an actor, it just confuses it, because how do you even know if it’s real? It was a high honor to collaborate with J.C. Chandor and Kasia Walicka-Maimone. This wonderful film project had great appeal to me because it is set in a time frame when women’s clothing was being revolutionized. Minimalism was a shocking new concept. The power suit was just beginning to find its way into the wardrobes of the most confident women. Jessica Chastain is a very charming woman and I find that she always wears my clothes perfectly, with great, nonchalant ease. 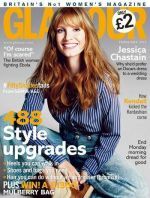 Chastain appears on the cover of the November issue of Glamour, and discusses being bullied as a child. I was told every day at school that I was ugly. And that no one wanted to be my friend. The most cruel things. If I can do anything to help young girls and to be a cheerleader for people who sometimes have low self-esteem, I want to do that. Chastain appears on the cover of the November 2014 issue of Interview magazine. She talks about doing comedy, being prepared as an actor, and interviews that didn’t characterize her correctly. There was an article that completely misquoted me, or re-edited what I said, to make their own conclusions. One time I was characterized as having this crippling fear, which is insane. I thrive on fear. Fear actually propels me forward. I am an emotional person. I’m an awkward girl. I get a little shy, and I get nervous a lot. But every time I think I can’t do something, I actually want to do it. I’m very in touch with my emotions, but I’m not a crybaby. Chastain and Fallon discuss selfies on The Tonight Show Starring Jimmy Fallon. Chastain accepts the ALS challenge from Anne Hathaway and nominates Mindy Kaling, Julianne Moore and Sandra Bullock. Chastain accepts the ALS Ice Bucket Challenge after being nominated by Anne Hathaway. She nominates Mindy Kaling, Sandra Bullock, and Julianne Moore. Alright Anne Hathaway, I accept your challenge. I’m going to donate to ALS and douse myself with ice water. Chastain gives an interview to The Talks. She discusses whether she fear failure and being broke. Chastain appears on the cover of the December 2013 issue of Vogue magazine. She talks about her life and her confidence. I did not feel like a beautiful woman that people would kill each other for. Jessica — who I am in my personal life — I’m very shy, I feel very awkward, I don’t feel like a femme fatale at all. The Guardian interviews Chastain about maintaining a busy career schedule and working hard to stay on top. You know when you’ve worked so hard for something? And you finally get a taste of it? That’s how I felt last year. Like: oh my gosh, I’m an actress getting to the point where [Zero Dark Thirty director] Kathryn Bigelow will call me on my cell phone. You want to grasp it, not let it go. This year’s the first time I’m starting to think that I don’t need to be so terrified it’s going to go away. I don’t have to work every single second. It’s new starting to exhale. It made me very, very depressed. I don’t know if I should say this, but there was a day, after we’d been filming for a couple of months, when I excused myself, walked off set and burst into tears. 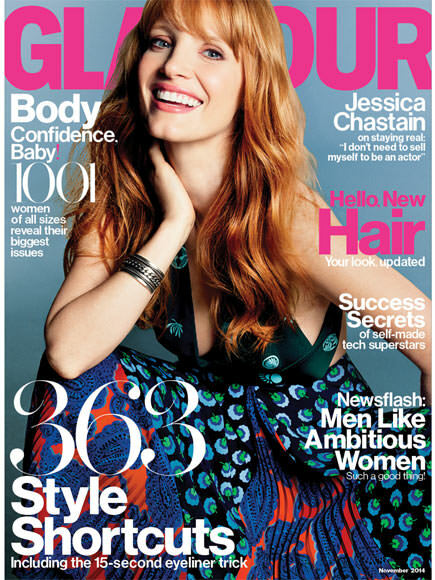 Chastain appears on the cover of the January 2013 issue of British GQ magazine. She talks about working with Brad Pitt, her film Zero Dark Thirty, and being a redhead. You Brits are usually so mean to your redheads. Why is that? In America it’s seen as a good thing. Look at Julia Roberts – she’s cool, right? I was working in Thailand and I’d be walking down the street and people – British people – would stop the car and scream, ‘ginger!’ at me. Chastain appears on the cover of the January 2013 issue of W magazine. She talks about envisioning she was right for Tree of Life, trusting a fellow artist, and getting a character for The Heiress on Broadway. I love the feeling of giving myself over to another strong point of view. It’s the best kind of trust—the belief that an artist will take care of me while creating something unique. Chastain appears on the cover of the October 2012 issue of Crash magazine. She is featured in the magazine in several black and white photos. Chastain appears on the cover of the September 2012 issue of Vanity Fair. She is first in the magazine’s International Best Dressed List: Women. 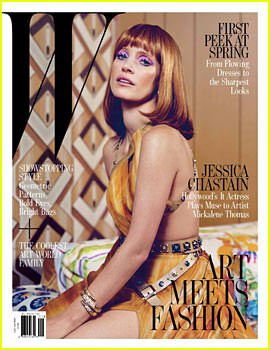 Chastain appears on the cover of the Summer Fashion and Beauty 2012 issue of T magazine. 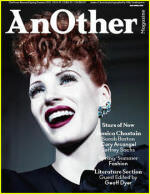 Chastain appears on the cover of the Spring/Summer 2012 issue of AnOther magazine. She talks about her favorite co-stars. Chastain is nominated for Best Supporting Actress at the 84th Academy Awards for portraying Celia Foote in The Help. I got a message from my agent that said, ‘Congratulations on your Oscar nomination,’ but that’s all I know, and part of me is like, ‘What if there was a mistake?’ But I think I’m very happy. I’m very, very, very happy. Chastain appears on the cover of the December 2011 issue of Asos magazine. She talks about her first red carpet experience, when Vogue named her their latest style crush, and when Madonna presented her with the Gucci award. Chastain appears on the cover of a September 2011 issue of Los Angeles Times magazine. She talks about how she approaches each role.